The resignation of Pope Benedict XVI and the election of his successor raise some fascinating questions, most of which find their answers in the distant past. When was the last time a Pope resigned? Until this year, no Pope had quit since 1415, when Gregory XII resigned to end the Great Schism (a.k.a. the “Western Schism”). The Church had been divided since 1387, with two and sometimes three men claiming the top job, some at Rome and others in southern France, at Avignon. After several attempts to resolve the schism, the Church convened the Council of Constance, which pressured all three current claimants to quit. 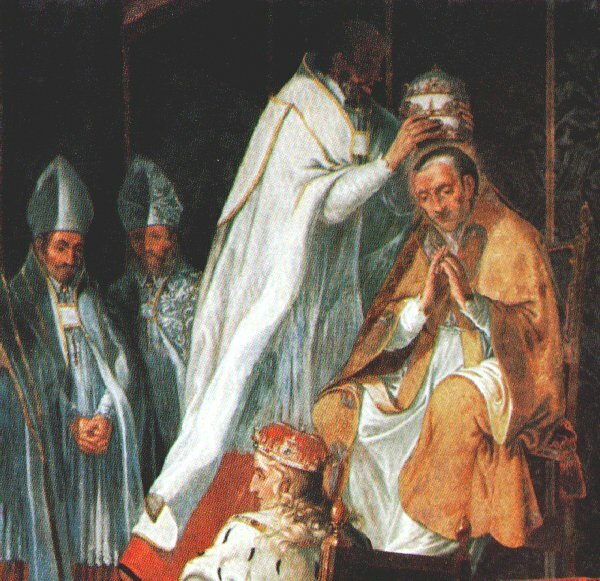 Gregory XII was the Roman claimant, and before he quit, he authorized the Council to choose his successor. The modern Church sees Gregory’s two rivals as “antipopes” — illegitimate claimants — so it’s Gregory who’s remembered as the last man to become a living ex-Pope. Who chooses the new Pope? What’s a cardinal? The Pope is Bishop of Rome, and in the Church’s early days, the Christians of each diocese (district) elected their own bishops. By the Middle Ages, however, the German emperor (a.k.a. “Holy Roman Emperor”) had come to dominate papal elections. So in 1059, Pope Nicholas II decreed that Rome’s “cardinals” would elect the Pope, and he enacted rules to limit imperial meddling. “Cardinal” comes from the Latin word cardo, meaning “hinge.” In ancient times, it referred to a priests incardinated, or attached, to a church. Eventually, however, “cardinal” evolved to mean the high-ranking priests attached to one of the really important dioceses, like Constantinople, Ravenna, or Rome. The Roman cardinals of 1059 included both important local priests and the bishops of the small towns surrounding the city. In the 1100’s, however, the Popes began giving these local positions to priests and bishops from elsewhere in Europe, and most cardinals’ connection to the churches around Rome became theoretical. That’s how this group of local priests became an international body — a better fit for electors choosing an international ruler. To this day, however, almost every cardinal is technically the head of a church in or near Rome, or the bishop of one of the surrounding towns — though they’re just figureheads and don’t actually run the local churches. Most modern cardinals are also bishops (not figureheads) of some diocese elsewhere in the Catholic world. Today, there are roughly 200 cardinals, and the 120 or so younger than eighty can vote for Pope. They need a two-thirds majority to elect him. The cardinals wear red, symbolizing their willingness to bleed and die for the faith (though the job’s not so risky nowadays). What’s the deal with the chimney and the black and white smoke? Papal elections have been held in the Sistine Chapel since 1492, and it’s been the sole venue since 1870. Almost no one other than the cardinals can enter during the voting, but a chimney installed just for the election keeps the world up to date. After a vote without a two-thirds majority, the cardinals mix the ballots with damp straw (and nowadays with chemicals) and burn them. The resulting black smoke rising from the chimney tells the world that the vote hasn’t yielded a new Pope. Dry straw, on the other hand, produces white smoke and signals a new Pope. How does the Pope get his new name? In 532 C.E., a man named Mercurius was elected Pope. He’d been named after the god Mercury, and he didn’t think a Pope should have a pagan moniker. So he decreed that he’d be called John II. That launched the papal practice of adopting a new name, though it didn’t become really common until the 900’s. The last Pope to keep his own name was Marcellus II, who ruled for twenty-two days in 1555 before dying of exhaustion. Popes usually choose the name of a past Pope they admire, so the choice offers a peek into the new leader’s beliefs and priorities. Has there ever been a non-European Pope? Yes, contrary to popular belief, several non-Europeans have led the Church. First of all, the original Pope, Saint Peter, was a Jew from Palestine: a Middle Easterner. Since his time, seven Popes have hailed from the eastern Mediterranean — mostly from Syria — and three from North Africa. That’s not surprising because those regions were part of the Roman-Christian world until the Muslim invasions of the 700’s. Interestingly, the first Pope to speak Latin, instead of Greek, came from North Africa: Victor I. Victor and the other North African Popes probably weren’t black, but they may have included dark-skinned Berbers. Anyway, religious hostility shut the doors between Europe and the Middle East after the 700’s. So since the death of Syrian Pope Gregory III in 741, all Popes have been Europeans. Has a woman ever been elected Pope? Nope: “Pope Joan” is a myth. During the 1200’s, a story began circulating that one of the Popes from around 1100 was a woman. She kept her gender a secret until she accidentally gave birth in public, which led to her execution. Protestants particularly enjoyed Pope Joan’s tale centuries later, since it discredited the papacy. But there’s no evidence from the time — from the years around 1100 — so it’s almost certainly false.